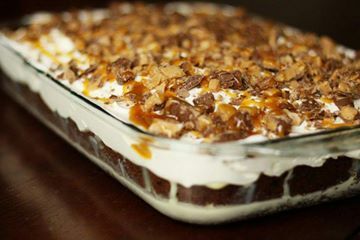 A Slice of Heaven Cake is a rich and very tasty cake using German Chocolate cake mix, sweetened condensed milk, caramel topping, Cool Whip and Snickers bars for a decadent dessert creation. Bake the cake according to directions in 9x13 inch pan. Cool for 5 minutes. Using the handle of a wooden spoon poke holes into cake, then let cake cool for about 1/2 an hour til warm. Slowly pour sweetened milk over cake, letting milk cascade over cake. Let cake cool completely (you may refrigerate it to cool faster just cover well). 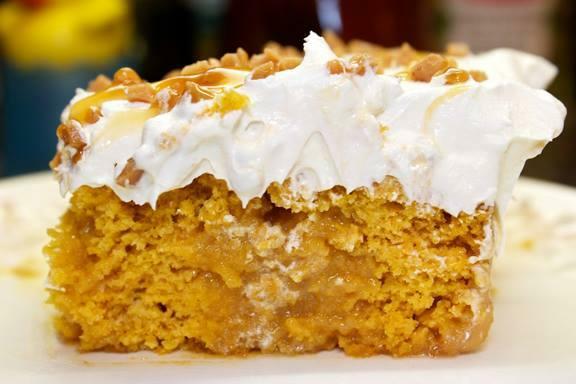 Top cake with cool whip, decorate with candy & drizzle with caramel.